Unlikely as it may seem, the proprietors of Kelly’s Roast Beef declare that the roast beef sandwich was unknown to the world until 1951, when the original Kelly’s on Revere Beach invented it. 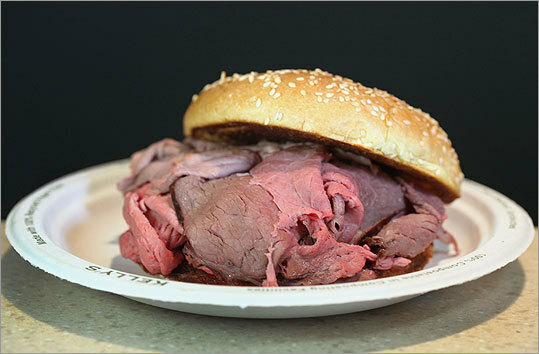 Sixty years later, roast beef is a standard option on the world’s sandwich menus, but Kelly’s iconic stack of pink meat on a buttery toasted bun remains the Boston favorite. The walk-up window in Revere — you can’t really call it a restaurant, though there are a few tables outside if you don’t feel like walking back across the boulevard to the beach just yet — also remains iconic. Even on a recent rainy afternoon, there was a bit of a wait. But you don’t have to go there to sample Kelly’s Roast Beef. Over the years, Kelly’s has moved, along with its customer base, to such outposts as Saugus, Danvers, Medford, and Natick. The Natick spot, which occupies a substantial corner of the Jordan’s Furniture building just off Route 9, is particularly family-friendly, a bright and spacious room with carousel horses and kitschy cherubs that are a nod to the vanished amusement park across from the original shack. It also holds a giant, round fish tank and a machine that lets the kids mix their own ice-cream-and-sprinkles combinations. Most recently, the mini-chain has colonized the former Marty’s Liquor space at the corner of Harvard and Commonwealth avenues in Allston. With a keen eye toward the needs of the neighborhood’s many students, this Kelly’s offers delivery and is open every night until 2 a.m.
During the day, though, it’s as child-oriented as Natick, with its own carved wooden horse and plenty of comfortable, stylish green booths. (No fish tank, alas.) The menu, like Natick’s, features a kids’ section that includes Kayem hot dogs ($4.75 with drink and choice of fries, applesauce or fruit) and Kraft mac-and-cheese (same price, same choices). But the kids can have Kraft any time. Do them a favor and let them share your sandwich instead. For you will, despite a few options in the salad and fried-seafood departments, be ordering a sandwich. Need it be said that the roast beef is the way to go? Rosily medium-rare beef, generously stacked, fills the sesame-seed bun — and a small ($5.95) is plenty. Get barbecue sauce or horseradish or even cheese if you insist, but true carnivores know that a swipe of mayo is all the beef needs to set off its succulence. Don’t mess with greatness. If, somehow, you’re at Kelly’s Roast Beef but don’t want roast beef, you do have other options. The reuben ($8.95) features plenty of pastrami, though it could use more sauerkraut for tang; the Russian dressing, served on the side, helps make up for that. The lobster roll ($16.95 with fries and onion rings — talk about overkill, and the onion rings need salt) brims with a bounty of large, tender chunks of meat, barely bound with mayo. Even in Allston, it summons a sea breeze. Or, OK, fine, get the new vegetarian wrap ($5.95), a perfectly decent avocado-pepper-lettuce-tomato-onion rendition. But if that’s really what you want, are you sure you’re in the right place? Louise Kennedy can be reached at louisekennedy330@gmail.com. 1227 Commonwealth Ave., Allston, 617-782-3999, and Route 9 East (inside Jordan’s Furniture), Natick, www.kellys roastbeef.com. (Other locations in Saugus, Danvers, and Medford.) All major cards. Wheelchair accessible. Hours Daily 10 a.m.-2 a.m.
May we suggest Small roast beef sandwich, lobster roll, reuben sandwich, vegetarian wrap.